'To My Brave Sisters': Malala Speaks To Missing Nigerian Girls : Goats and Soda Like the kidnapped girls, Malala Yousafzai was targeted by militant extremists for wanting an education. The activist wrote a heartrending letter to the girls on the anniversary of their abduction. 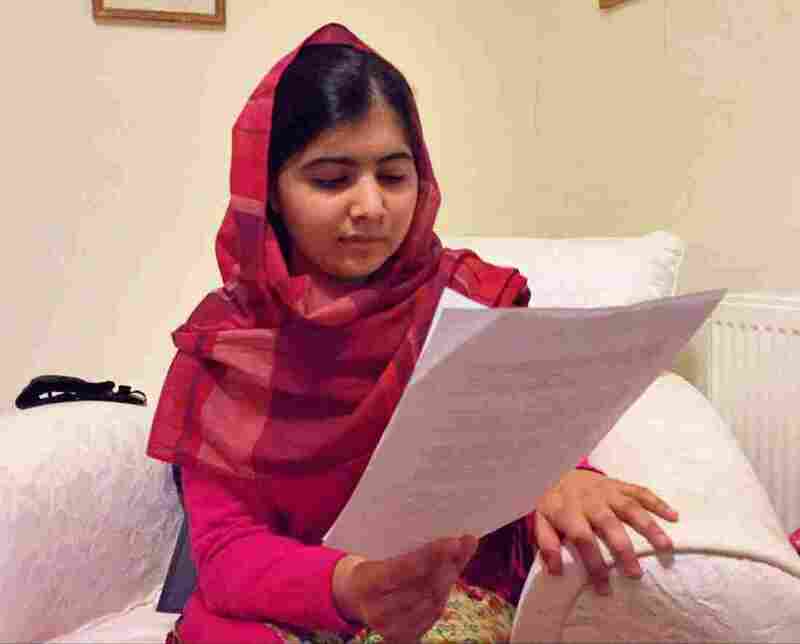 At her home in the U.K., Malala Yousafzai reads her letter to the missing Nigerian schoolgirls. "One day your tragic ordeal will end, you will be reunited with your families and friends, and you will have the chance to finish the education you courageously sought," Malala Yousafzai said Monday to the girls in Nigeria who have been missing for a year. Last April, Boko Haram abducted several hundred girls while they were at school. On the eve of the abduction's anniversary, Malala wrote and recorded a solemn letter to her "brave sisters." She said, "we will never forget you. We will always stand with you, today and every day." Like the missing girls, Malala was targeted by militant extremists. The Pakistani teen was shot in the head by a Taliban gunman in 2012 while advocating for girls' right to education. In her letter, Malala recounted her meeting last July in Nigeria, on her 17th birthday, with the families of the kidnapped girls and five girls who had managed to escape. Malala said she wept during the meeting, but she was also impressed by the students' resolve to continue going to school. More than 200 girls are still missing, and on Monday, Malala assured them that she has urged Nigeria's outgoing president, Goodluck Jonathan, to meet with the victims' families — which he did a few days afterward. Then in her letter, Malala voiced her frustration with the rescue efforts. "Still in my opinion, the Nigerian leaders and the international community have not done enough to help you," she said. "They must do much more to help secure your release." Many advocates with the group #BringBackOurGirls agree with Malala: The government has done too little, too slowly for these girls. But there are reasons for optimism, Malala told the girls. "Nigerians are regaining territory [from Boko Haram] and protecting more schools," she said. "Nigeria's newly elected president, Muhammadu Buhari, has made securing your freedom a top priority." Malala promised all the girls that when they return home, her organization, the Malala Fund, and their partners will offer full scholarships and other forms of support. The organization has also started #DearSisters, a project asking others to write their own messages to the missing girls. In two days, they've received more than 2,000 letters from around the world, says Louis Belanger, a spokesperson for the Malala Fund. He says they'll print out all the messages — some translated into the Kibaku language — and deliver them to the victims' families. Malala's own letter ends with a final message to the kidnapped girls: "Stay strong and never lose hope. You are my heroes."